Ostrich feathers are a popular decoration choice for many event planners – especially couples organizing a wedding. There’s something alluring about the luxurious texture and brilliant color of ostrich plumes and drabs. Before you begin building a DIY wedding centerpiece, make sure you read the following so you can create the most spectacular presentation in less time! Single and double color wedding centerpieces look gorgeous, but don’t feel stuck with a limited palette when designing your décor. Some ostrich feather centerpieces feature three or four colors that look stunning. For example, if you’re planning an autumn event you may want to go with red, yellow and orange feathers. If you’re planning something for Mardi Gras, try purple, green and yellow. You can keep your ostrich feathers clean and fluffy simply by steaming them! Rub the feather between your fingers then place in a stream of steam from a boiling pot of water. Take care not to burn your fingers on the steam while you fluff your ostrich feathers! Floralytes look great with ostrich feathers! Ostrich Feather Design Tip 3: Light Up Your Ostrich Feather Centerpieces! Light is a great way to grab attention. You can add candles, LEDs or Floralytes to your arrangement to give it a subtle glow. This is a great way to add detail to guest tables and other key areas within your venue. When choosing Floralytes, look for a bulb that matches your theme or color scheme. 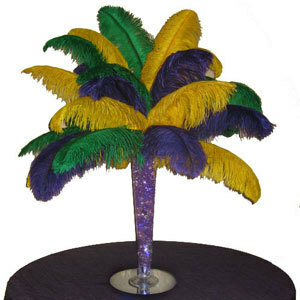 A single row of ostrich feathers looks nice, but won’t have that lush fullness that makes this decoration so appealing. Remember to add layers by stacking feathers and using feathers of different sizes. Drabs and plumes will give you more dramatic variation. Your ostrich feather centerpieces do not have to be 100% plumes and drabs. You can always experiment to customize the display. Add lighted branches, dangling embellishments, beads, sparkles and whatever else fits the tone of your wedding!